The class Ge 4/4 III are among the newest locomotives in the world. These locomotives pull express trains as well as freight trains. 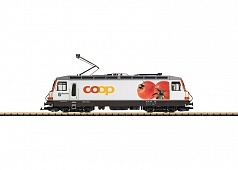 The model of the Ge 4/4 III, Road Number 641 has full advertising for “Coop”. The paint scheme and lettering are prototypical. 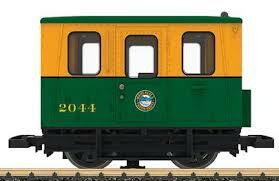 The locomotive has two powerful Bühler motors driving all of the wheel sets, and it has traction tires. The locomotive is equipped with a sound decoder with many special functions such as headlight changeover, controllable lighting, and much more. The locomotive has a selector switch for the mode of operation and general-purpose sockets. The pantographs are powered by motors. The cab doors can be opened. Length over the buffers 65 cm / 25-5/8″.